The legendary Kirk Douglas turns 100-years-old today and here are two largely unknown anecdotes about the star: One inadvertently connects him to Lee Marvin and the other is quite personal. 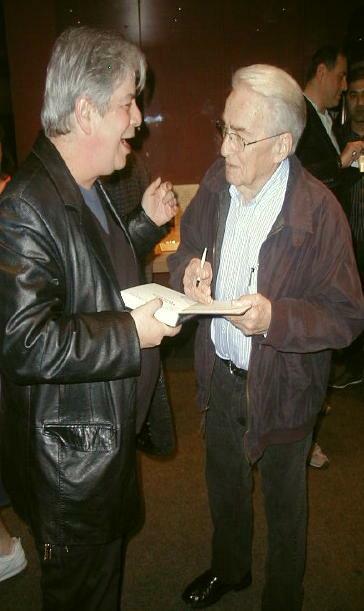 The author of LEE MARVIN POINT BLANK (left) getting “Cat Ballou” director, Elliot Silverstein, to sign his copy of the book at the Egyptian Theatre in 2013. Dwayne: Did you have Lee in mind from the beginning? D: How did you think of Lee? And the rest, as they say, is history. Don’t get me wrong, there’s no way to ever know for sure if Kirk would have won the Oscar had he played Kid Shelleen, but who knows, right? Wonder if he regrets that as much as he regrets not playing McMurphy in the film version of One Flew Over the Cuckoos Nest? The speculation is endless. By the way, if you want to see what he would have been like as McMurphy, since he had played the role on Broadway, check out the underrated, bizarre western, There Was a Crooked Man. A personal favorite of mine and one of the strangest films EVER! And now, the personal anecdote. 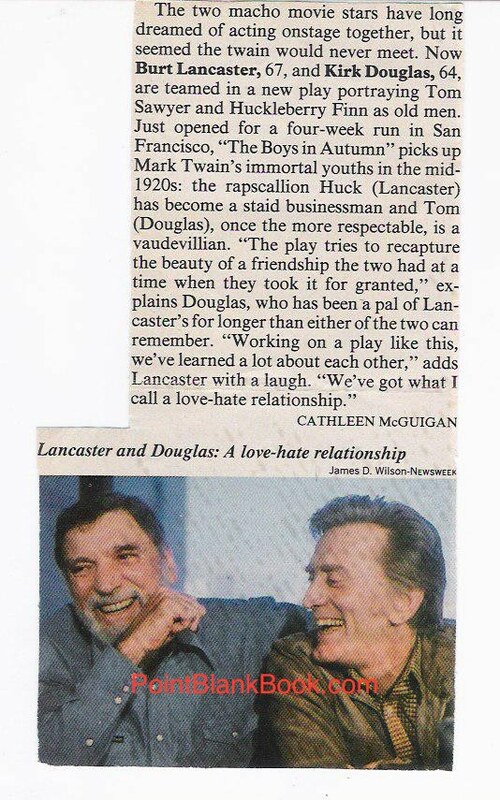 Back in 1981, I had read that both Kirk Douglas AND Burt Lancaster were going to appear on stage together as Huck Finn and Tom Sawyer as older men in the 1920s. 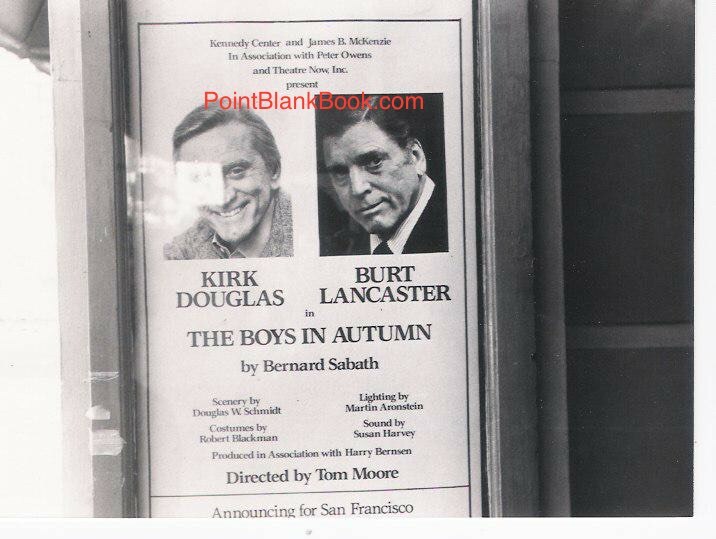 It wasn’t easy, but I managed to talk my childhood friend, Ty Elliott, into going with me up to San Francisco to see the two legends in the brief run of “The Boys In Autumn.” Why? Because ever since he and I were kids The Adventures of Tom Sawyer was our favorite book and Burt Lancaster was our favorite actor. Who could ask for more! After the play, we went over to a Bar & Grille to get drunk and bemoan both the play and the fact that we didn’t get to meet either of the two legends in-person to actually talk to. We were on our umpteenth gin & tonic when who should walk into the crowded establishment to pick up a to-go order? That’s right, the dimpled chin one himself, looking every inch a movie star. He came in like a whirlwind, wearing slacks, a dapper tan trench coat over a ribbed red turtleneck, hair flipping as he walked looking 20 years young than his mid-60s. He sat down in the shadowy corner waiting for his food, while I screwed up my courage. I downed the rest of my drink, gathered my screwed up courage, and took the long jaunt over to where he impatiently sat, hoping not to be bothered by fools such as I. Good thing I was drunk. It was a moment that for obvious reasons I’ll never forget. Incidentally, a few seconds later, I watched Ty down his drink and do the same thing before Kirk Douglas beat his hasty retreat. And now, now that he’s made it to the one hundred year mark, I say again, thank you Kirk Douglas. And here’s to a hundred more! Did I ever mention the time I met Burt Lancaster? Ahh, perhaps another blog entry…. As readers of Lee Marvin Point Blank know, the actor’s career did not really ascend until the mid 1960s, but interestingly enough, he did get his first film lead in the early 1950s. Based on the play A Sound Of Hunting by Harry Brown, Marvin had actually played the role of Sgt. Mooney even earlier when he was still working as a stage actor in New York. 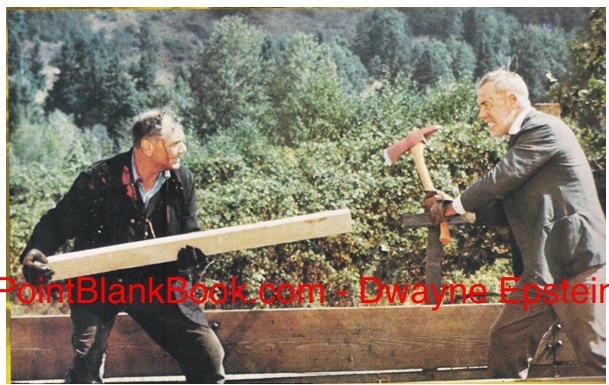 Lee Marvin (left) and unknown costar in a rare color image of a stage production of A SOUND OF HUNTING. The original Broadway production was not a hit with theatregoers of the day, as it told a tale that many who were combat vets themselves were all too familiar with at the time. A small company of soldiers in Europe during the war are hoping to go home soon, but instead, discover they are due to return to battle. In the interim, one of their numbers gets pinned down in the crossfire of a German machine gun nest. Sgt. Mooney, the leader of the exhausted, dwindling company, argues with his C.O., fights to keep his men in line, but mostly is fraught with the ultimate decision of what to do with their comrade left out in the crossfire. Basically a character study, it gave the all-male cast ample opportunity to flex their acting muscles in a taut little drama. A rare photo depicting the set and entire cast of the short-lived Broadway play, A SOUND OF HUNTING. On the far left is Sam Levene and next to him is Burt Lancaster. The Broadway play opened at the Lyceum Theatre on November 20, 1945 and closed after just 23 performances on December 8th. 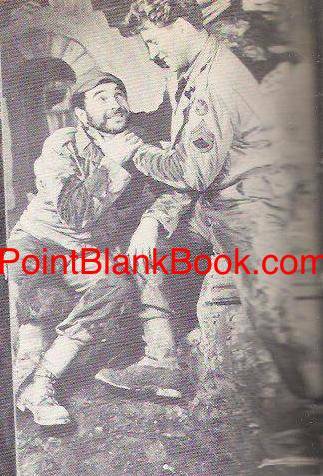 The play remains an interesting footnote mostly notably for the actor who originated the role of Sgt. Mooney. He was an untrained actor with a show business backgound as an acrobat following a stint in the Army’s Special Service Corp. A fledgling agent saw the play, liked the young actor’s presence and offered the young man a Hollywood deal with legendary producer Hal Wallis. The young actor was brash enough to state that he wouldn’t go to Hollywood unless he could produce his own projects. Amazingly, a deal was made. The agent was Harold Hecht. The actor was Burt Lancaster. They formed Hecht-Lancaster Productions and the rest is of course history. When Hecht became an independent producer (minus his partner Lancaster), his greatest solo success was 1965’s Cat Ballou. Sam Levene (left) and Burt Lancaster (right) in the original production of A SOUND OF HUNTING. 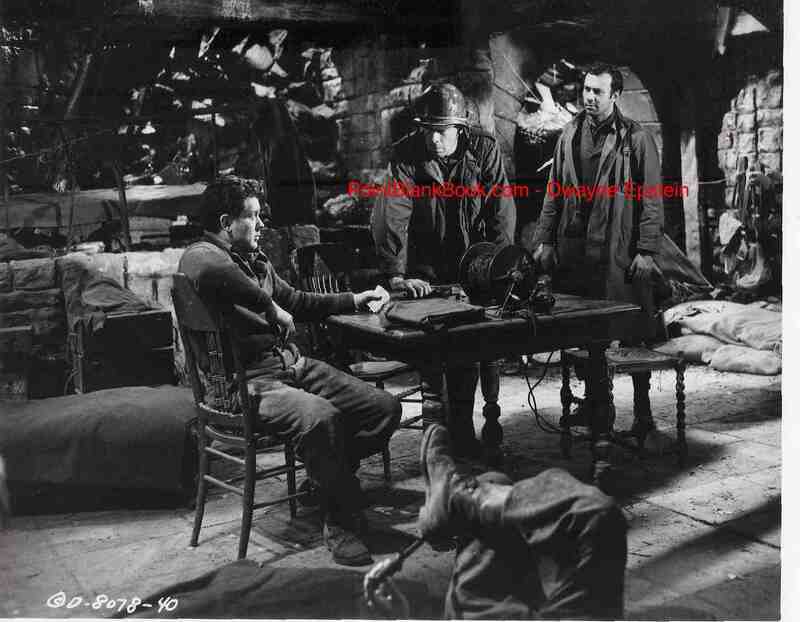 As for the film version, titled Eight Iron Men, it was produced by maverick filmmaker Stanley Kramer and directed by noir veteran Edward Dymtryk. The cast consisted of Marvin, along with Richard Kiley, Bonar Colleano, Nick Dennis, Arthur Franz, Dickie Moore and Barney Phillips. By the way, there was also two TV versions of the story. In 1955 Lux Video Theatre aired a version under the film’s title of Eight Iron Men with Russell Johnson (the professor on Gilligan’ Island), William Schallert (Patty Duke’s TV father), Gene Reynolds (co-creator of TV’s M*A*S*H), a grown-up Carl ‘Alfalfa’ Switzer, and directed by Biuzz Kulik who would later direct Marvin in Sgt. Ryker. Believe it or not, there was yet another version for TV under its original title of A Sound of Hunting which aired in 1962 on the antholgy series, Dupont Show of the Month. The cast was even more eclectic as it consisted of Peter Falk, Sal Mineo, William Hickey, Gene Wilder and Robert Lansing in the role of Sgt. Mooney. 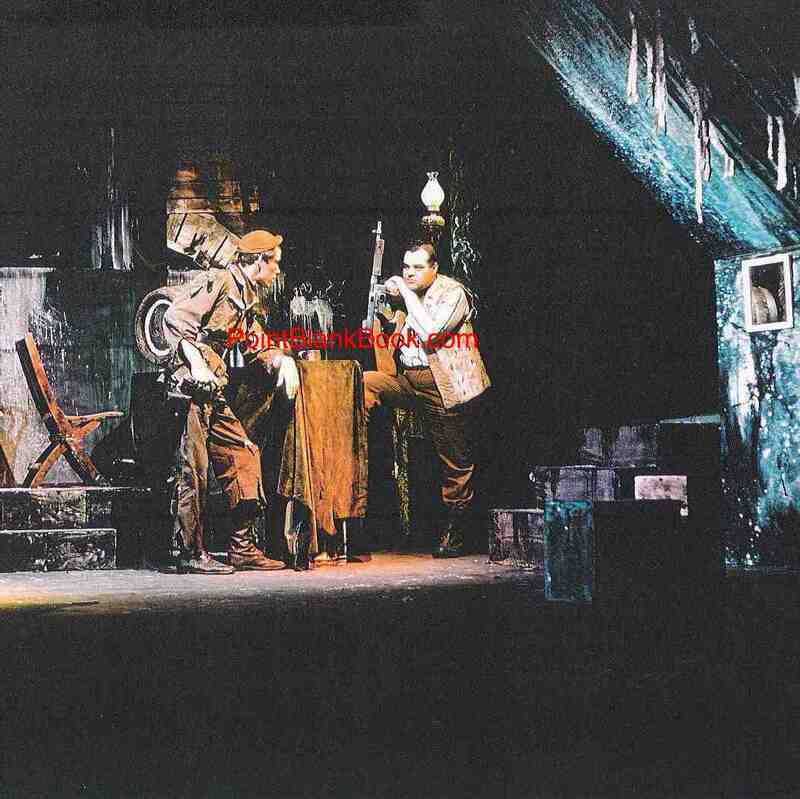 Arthur Franz (seated), Marvin and RIchard Kiley argue the fate of their comrade in 1952’s EIGHT IRON MEN. Lee Marvin as Sgt. Joe Mooney and shapely costar in a dream sequence ultimately cut from the final version of EIGHT IRON MEN. Presenting the pentultimate installment in my own choices of favorite movie fight scenes. I became even more aware of the distinct changes that took place thru the decades, due to researching Lee Marvin Point Blank and discovering Marvin’s important influence on screen violence. This time, the late 60s lead into to the early 70s, with both known and obscure choices. Nautrally, Lee Marvin is duly represented. Rod Taylor (left) unrelentingly takes on Peter Carsten (right) for the murder of Jim Brown. Unrelenting. That single word is the best way to describe Rod Taylor’s battle with his opponent in the underrated action opus Dark of the Sun. One of the 1960s many international productions, this one deals with mercenaries carrying out a mission in Africa to save both missionaries and a cache of diamonds…they are, after all mercenaries. The film contains plenty of action, incuding train battles, buzzsaws and such obligatory eye candy as Yvette Mimiuex. But, the growing animosity between team leader Rod Taylor and former Nazi team member Peter Carsten, results in one of the most brtual and unrelenting fight scenes of its era. When Taylor leaves the team momentarily, Carsten kills Taylor’s comrade Jim Brown and attempts to abscond with the goods. When Taylor returns and discovers what transpired, no amount of common sense or cajoling can stem the tide of his anger. A rousing climax to a film that just made me a Rod Taylor fan all over again. I’ve read that his fight scene in Darker Than Amber (1970) with William Smith is even better but since I’ve yet to see it, this will have to suffice. Maybe if I revamp this list in a few years I’d have seen it and changed my mind. Until then, Dark of The Sun. Unrelenting. 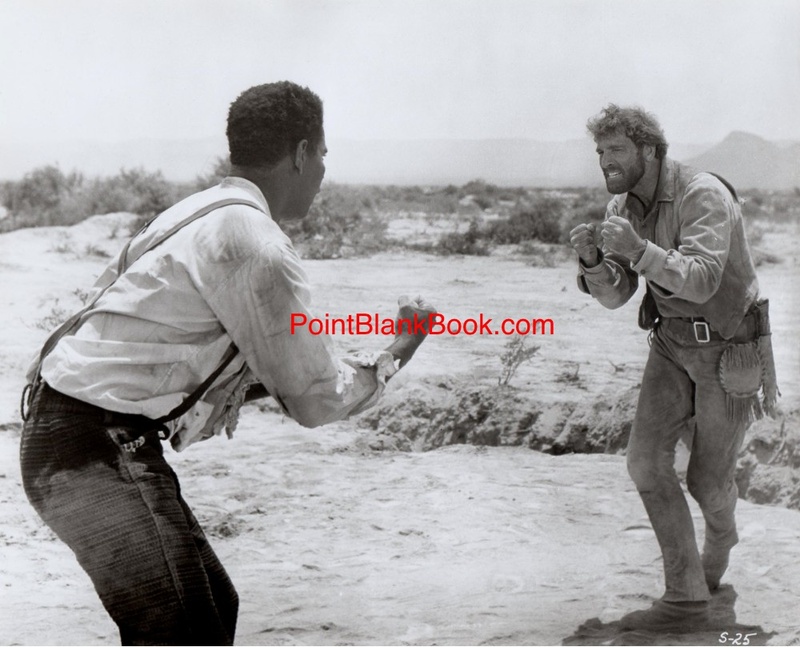 Burt Lancaster as Mountain man Joe Bass (right) tries to teach a lesson to runaway slave Joseph Lee (Ossie Davis, left) as the plot continues around them in The Scalphunters. By the end of the 1960s, not only had the studio system and ancient production code bitten the dust, the but social upheaval of the times had permeated films of every genre, including the sacred western. No all such attempts at social relevance were successful but The Scalphunters certainly was. The simple plot of a mountain man trying to retreive his stolen pelts from a gang of merciless scalphunters is complicated by the presence of a runaway slave, a wily madam and a band of often drunken Indians. Fans of star Burt Lancaster’s will recognize the film as a bit of a vanity project since it includes the likes of childhood friend and acrobat partner Nick Cravat as well as longtime stunt double Tony Epper as scalphunters, and ex-girlfriend Shelley Winters as the madam. Even former TV executive Telly Savalas, whom Lancaster successfully talked into giving acting a try, wonderfully chews the scenery as the lead villian. Probably the weakest link, at least in my opinion, is Ossie Davis as the runaway slave. He seemed miscast, as another black actor form the period, such as Al Freeman or Ivan Dixon, might have been better suited in the role. Alll that aside, the climatic and lengthy battle between Lancaster & Davis through mud, sand, dirt, and crevasses, is wonderfully rendered as the remaining plot points go on without them even noticing! Lancaster was in his 50s when he made this but you’d never know it from his physical performance. The film doesn’t preach it’s point of view. It’s done in a style of rousing fun. REALLY worth a second look! Why is this movie on the list, you may ask? Well, picture this: it’s the summer of 1970 and Tim Romero and I decide to go to the movies. Only decent thing playing for a couple of ten-year-old boys is this John Wayne programmer. So we go. Sit through the tedious plot (a largely fictiously tale about Billy the Kid, I later learned) and we are just about to leave out of sheer boredom when John Wayne turns to his buddy Ben Johnson and drawls, “Break out the Winchesters.” Johnsons smiles big and says, “Why sure.” Tim and I give out a hoot and we are in little boy heaven. 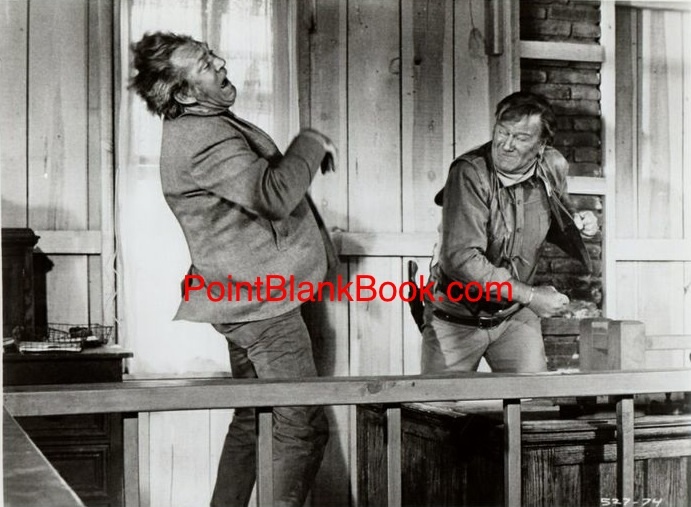 While a gun battle rages, John Wayne seeks out lead bad guy Forrest Tucker and proceeds to beat the holy hell out of him. Folks, it just doesn’t get any better than this for a little boy summer matinees. Not great movie making by any stretch of the imagination but I watched it again recently and felt like that little kid again. Nostalgia aside, I genuinely feel sorry for young film goers who think comic book films and their attended CGI effects are worth their time and energy. Unless you’ve felt that child-like adrelaline rush of hearing “Break out the Winchesters,” you are just plain missing out on a great childhood moment. The real clash of the titans as hobo Lee Marvin challenges sadistic railroad man Ernest Borgnine in Robert Aldrich’s Emperor of the of the North. This one could quite possibly earn the right to be called my favorite fight scene of all time as it has, in my opinion, never been equalled. The making of director Robert Aldrich’s violent, non-sentimental, Depression-era fable of non-conforming hobo Lee Marvin challenging the railroad establisment in the person of sadistic conductor Ernest Borgnine is covered in-depth in Lee Marvin Point Blank, of course. All I can add here is the fact that the fight scene at film’s end may not be beleviable for some people from a realistic standpoint, as it’s been pointed out, but within the realm of the story, it is perfectly in keeping with the film’s style and overall theme. Axes, chains, and 2×4’s may not be worthy weapons in modern films but it certainly makes sense for the Depression! 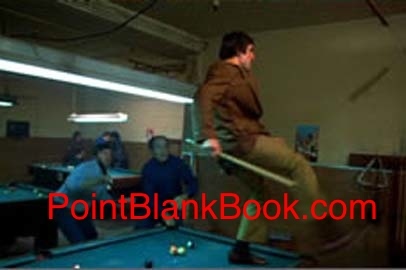 Robert DeNiro, with pool cue in hand, takes on all comers in Martin Scorsese’s Mean Streets. Once again, there is not a whole lot more I can add to anything that’s been said of Martin Scorsese’s and Robert DeNiro’s breakthrough film that has not been said a dozen times already. The modern day noir exploded on the screen in 1973 and rattled the minds of moviegoers in the process. There is so much to take in when viewing this masterpiece that several viewings is just not enough. Lasting images permeate every frame, drenched in overly saturated color and photographic stylings. It’s inclusion here is for one such image. When Harvey Keitel and his buddies go to pick up an overdue loan at a pool hall, it isn’t long before all hell breaks loose. The most eye-popping aspect of the brawl is, without a doubt, DeNiro as Johnny Boy. He scrambles to the top of a pool table and plays ‘King of the Mountain’ to anyone who tries to get near him. He’s as crackling an explosive as the cherry bomb he drops in the mailbox in the film’s opening. Try to find a more beleviable street fighter in a movie than Johnny Boy. G’head, I dare ya!